SUGARFISH’S simple decor doesn’t distract from the main event: the fish. On a recent day of errands with my daughter, we were suddenly hit with mid-afternoon munchies. The question was: what would satisfy our hunger yet not ruin our appetites for dinner? Sushi seemed the perfect answer. We headed to Sugarfish on La Brea, one of eight storefront locations of this raw fish restaurant. Eschewing fancy rolls with gooey sauces, Master Chef Kazunori Nozawa’s vision is for impeccably sourced, unadorned seafood. At most, there might be a little ponzu (citrus) sauce lightly splashed here and there. The simple décor doesn’t distract from the main event: the fish. The house specializes in “Trust Me” combinations. There are three versions, ranging from Trust Me/Lite which comes with four pieces of sushi and two rolls for $17 to the $35 Nozawa Trust Me with 10 pieces of sushi, tuna sashimi, and two rolls. My daughter and I shared the latter, which made for a surprisingly reasonable sushi lunch tab—but it’s really meant to feed one. Pricey, perhaps, but one can’t argue with the quality. Fish was presented with reverence for the flavor that fresh seafood can deliver. The thinly-sliced sashimi was delicate, delicious, almost unctuous on the tongue. Silken slices of halibut, salmon, albacore, scallop and yellowtail were draped over perfect lozenges of rice. The cut rolls were a balanced layering of fish, rice and nori (seaweed). This is arguably the best sushi available in our neighborhood, but I have to admit that I’m not a sushi purist. I missed miso soup and a spicy tuna hand roll. 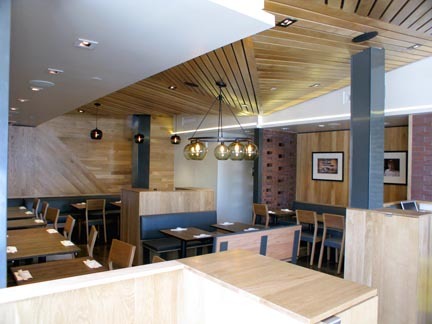 Sugarfish, 101 S. La Brea Ave. 323-488-3636. Beer, sake, white wine are available. Part of the early wave of hip restaurants to inhabit our revamped downtown, the still hopping Mas Malo presents homey Latin dishes to a hungry young crowd for mostly well-under $20 an item. The former 1920s jewelry store, downstairs from the popular Seven Grand Whiskey Bar, has a stunning original vaulted ceiling and a noise level that reduces patrons to shouting. Somehow, however, the liveliness coupled with the solid flavors of the Chicano-style Mexican food make for happy dining, even though the name means “More Bad” and customers are hoarse at evening’s end. The four of us started with Margaritas, chips, salsa, and a very good guacamole. The Blasted Half Chicken sported an apricot/jalapeno glaze. The sweet balanced the heat nicely on the boneless chicken breast (not the titled half chicken). Shrimp Diablo rocked the chilies and needed the neutral rice to tame it. Chicken “Carnitas” soft tacos, served alongside rice and beans, were delicious. Mas Malo’s signature Ground Beef & Pickle Tacos were filled with disappointingly dull beef. The pickles added a nice vinegary crunch, however. I wish there were more of them. Mas Malo, 515 W. 7th St. 213-985-4332. Full bar, with emphasis on an extensive tequila list.